Why Choose Aqua Sports Maui Kiteboarding Lessons? Cause We’re the Best Kiteboarding Lessons on the Planet! It’s Guaranteed! Focused on safety and fun we are dedicated to your efficient learning experience. Aqua Sports Maui Kiteboarding School has many distinct advantages over its competitors. Everyone is different and has different desires, learning styles and expectations, we match you up with the best instructor for your style . 100 % Guarantee: Our lessons are 100% guaranteed to please you. If you are not fully satisfied , please lets us know for a full refund. We are committed to giving you the best kiteboarding lesson on the planet. We guarantee to give you the best price available on the island, if you find a lower price , we will beat it. We guarantee that you will be taught by an experienced professional and certified instructor. Our kite boarding instructors are seasoned professionals with years of kiteboard teaching experience, no newbie instructors here. Our prospects must have a minimum of 1 year kiteboarding teaching experience before we even consider them for the job. Our school has more long term instructors than any other Maui Kiteboarding School! ( I think that says something! Instructors Certified to the Most Rigorous Standards: We believe we have assembled the best team of kiteboarding instructors in the world! Our instructors are certified to the highest standards, most hold double certifications, comprehensively trained to provide excellent instruction in all aspects of kiteboarding. All of our instructors also hold current CPR and First Aid Certificates. The patience, great attitudes and attention to safety from our expert instructors sets us apart and will help make your kiteboarding experience the best. Professionally Licensed: Aqua Sports Maui Kiteboarding Lessons is fully licensed, accredited and insured for your protection and security. Safety, Fun and Productivity: Your safety is our #1 priority. Our instructors are trained in the latest techniques of safety, instruction, ocean awareness and protocol. At Aqua Sports we will not teach you a lesson in unsatisfactory conditions, we want your experience to be the most productive and fun that it can be. If you are not having fun , you may stop the lesson at any time, reschedule or get your money back. That being said, we also know how to “make it happen” in many different conditions. The Best and Latest Equipment, all the Time. We use the latest gear in top condition. We use the finest, newest and best equipment from Cabrinha, Naish, Airush and North. Kites, Twin tips and Directional Surfboards perfectly suited to your level of experience, and all equipment is included with every lesson, so that you can count on every advantage in learning to kiteboard. After Lesson Care: Even after your lessons are over and you have finished our program, feel free to ask for advice, help buying equipment, a launch or a catch, we are happy to help you. Look for the bright yellow rash guards worn by our instructors -they are easy to spot and are always there when you need them. Our dedication doesn’t stop after your lessons.We encourage you to keep in touch and love to here about your kiteboarding experiences . Exclusive Extra Perks include: 10% off vip card valid for all merchadise at Maui’s best Kite/Windsurf/Surf shops! Aqua Sports Maui- King of Kite Beach! Aqua Sports’ beach presence allows its students and even former students complimentary use of all safety equipment : helmet, rash guard, flotation vest and harness. Our beach presence is especially appreciated by those students who continue on kiteboarding independently and need access to safety equipment and the occasional overview or advice from a certified instructor. Need a launch? A Catch? Just look for our yellow jerseys! We have many great used kites for sale and also are hooked up with all the shops so we can help you choose the right kites for you and also get you the best price on new or used Cabrinha, North Airush and Wainman gear . Please ask us about the special discount from the shops for our students. We will personal walk you in and introduce you to the shops of your choice, when you are ready to buy gear. 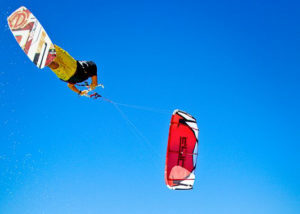 We base our lessons in Kite Beach, Maui, the world’s finest kiteboarding beach. The steady trade winds and warm, clean water make it easy and fun to learn to kiteboard, whether you’re a beginner who’s never seen kiteboarding, or a seasoned rider that wants to learn advanced techniques and maneuvers. Aqua Sports is a full service kiteboarding school dedicated to promoting safe, fun kiteboarding. Kite Beach provides a wide range of kiteboarding experiences, from flat water cruising inside the reef, to excellent wave riding on the outer breaks, and we have instructors ready to teach you in any of these conditions. Our Company Focus is Simple: We’re Here for You! To provide the very best and safest instruction to our students, with insight, encouragement, and total dedication at an affordable rate. Choose Your Level to Get Started!